Regardless of whether you’re traveling for business or pleasure, you want to make the most of your time in Abu Dhabi. Rather than trial and error (which inevitably can lead to regrets and missed opportunities), CIRE’s travel planners steer you in the right direction – from the best hotels, to the best places to eat with your family or impress a client, and what to do. The best recommendations come from personal experience, so CIRE Travel’s president, Eric Hrubant, returned to Abu Dhabi to “practice what he preaches.” The trip’s goals were two-fold: reconnect with CIRE’s partners and clients in the UAE and discover the places and activities well worth your time. 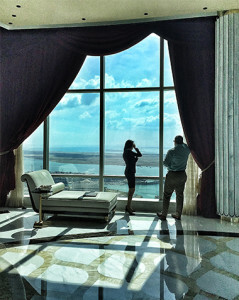 The St. Regis Abu Dhabi soars to new heights of splendor and service beyond expectation. Located at the vibrant heart of Abu Dhabi, it boasts one of the finest addresses in the city. Each of the hotel’s 283 rooms revels in a magnificent view of the alluring Abu Dhabi Corniche, making it a perfect location for both business and family travelers. The Abu Dhabi Suite, high on the skybridge between the two Nation Towers has an astonishing 360-degree view. The signature St. Regis Butler Service is complimentary for every room in the hotel. St. Regis Abu Dhabi has several dining options. At any time of the day you can experience a balanced mix of intriguing yet sophisticated tastes, flavors and sensations in its restaurants and bars. Try the Bloody Mary. It’s a meal on its own. Each St. Regis in the world has a signature Bloody Mary recipe. Fairmont Bab Al Bahr is situated at the gateway to the capital city. It’s a beachfront five-star hotel in Abu Dhabi with unrivaled views of Sheikh Zayed Grand Mosque. Located just a 45-minute drive from Dubai, it’s not far from Abu Dhabi’s attractions, including the first Ferrari theme park with the fastest roller coaster in the world, the Abu Dhabi Grand Prix race circuit, Yas Waterworld, the region’s largest waterpark, and Saadiyat Island. With a striking exterior made of sheer blue glass, Fairmont Bab Al Bahr features 369 contemporary and spacious guestrooms and suites, plus Fairmont Gold, a lifestyle hotel experience with discreet and attentive service that meets the needs of the most discerning business or leisure guest. Eight dining options serve world-class cuisine, including the first Marco Pierre White restaurant from the three Michelin star British chef complete the luxury experience. It’s so good that it is one of our favorite restaurants in Abu Dhabi. Park Hyatt Abu Dhabi Hotel and Villas is an award-winning, five-star luxury beach resort in Abu Dhabi nestled along the pristine beach of Saadiyat Island, only 25 minutes from Abu Dhabi International Airport. The resort lies on a vast stretch of environmentally protected white sand beach adjacent to the Saadiyat Beach Golf Club. There are 306 spacious guestrooms with private balconies, including suites and private villas featuring open-air plunge pools with ocean, garden or golf course views. Savor fresh flavors and local delights, all thoughtfully sourced and carefully served by a team of culinary experts at their award-winning restaurants and bars. True to the Park Hyatt brand, Park Hyatt Saadiyat Island Abu Dhabi Hotel and Villas offers understated luxury and gracious service in an intimate sanctuary, offering guests an experience that is distinctly inspiring. The pool offers picture-taking opportunities you don’t want to miss. Pearls & Caviar at the Shangri-La Qaryat Al Beri, Abu Dhabi is rebranding itself as a Spanish tapas restaurant at the end of April 2016. So, we’re glad we had the opportunity to enjoy it while it was open. The new restaurant, called P&C, by Sergi Arola will launch on April 25. The new restaurant will serve Spanish tapas, unique paellas and a variety of traditional Spanish dishes. If it’s like its predecessor, it’ll be delicious. Award-winning celebrity Chef Marco Pierre White brings his expertise for the first time to Abu Dhabi. With its dramatic interior design, including a back lit ‘flame’ wall, guests dine on eclectic combinations of innovative grill cuisine and classic English fare. Look at the wine list. The restaurant earned a 2015 Wine Spectator Award for having one of the most outstanding wine lists in the world. When you’ve eaten Chinese food in New York, you know you’ve had the best. That is until you dine at Ritz-Carlton’s Li Jiang. Eric claims it’s the best Chinese in the world. Sophisticated designs of wood and spices create a chic lodge effect and the kitchen is an open layout. You can watch the chefs prepare dishes in woks and on grills. The wait staff knows their stuff, so you can trust them for the perfect recommendation. It is the country’s largest mosque and is visited by over 41,000 people during Eid. The late president of the (UAE), His Highness Sheikh Zayed bin Sultan Al Nahyan, established the mosque to combine the Islamic worlds diversity, architecture and art. Beyond the aesthetic grandeur, is a library housing rare publications, visitor programs and cultural activities. For now, it’s still under development, but home to several districts that are family-friendly and definitely not to be missed. If you go to one place, walk around the Manarat al Saddiyat in the cultural district. It’s a small and private museum that will amaze, and the surrounding grounds have choice dining options. This is nirvana for F1 racing and motorsports fans. Get behind the wheel of a Formula® -style vehicle by booking a driving experience or just watch from the stands if a race is scheduled. Planning a trip to Abu Dhabi? CIRE’s travel planners have the first-hand experience and connections to help you make the most of your time there. Contact us for personal recommendations and arrangements.